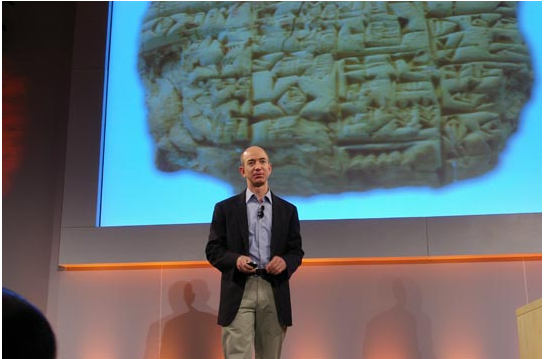 9:41 AM: Jeff Bezos takes the stage: Shows a tablet, then some papyrus, then a codex, a picture of Gutenberg (“invented mass production of books,” thanks jeff). He made 180 copies of his most famous book, the Gutenberg bible. 9:51: Shows the Kindle. 10.3 ounces, less than a paperback, and thinner too. Three years in the making. “We have 90,000 books you can buy right from the device. And these are the books people want to read. Included on are 101 of 112 New York Times best sellers. And guess what, they are all $9.99. And guess what? they all get delivered wirelessly in less than minute. You can also get newspapers delivered to the device: New York times, Wall Street Journal, San Jose Mercury News. Magazines. And blogs. This is not an RSS feed. this is the full content of the post pushed to your device. (Boing Boing, the Onion, Huffington Post, TechCrunch). Updated throughout the day.” [He stresses that this is not just the headlines and an excerpt, but he ignores blogs that publish their full content in their feeds. Is anyone really going to pay for a blog that they can get on the Web for free?]. 10:15 AM: Bezos is doing a demo. Shows his magazines and blogs (hey, how did TechCrunch get on there?). Shows how you can change the font size. There is a little scroll wheel on the bottom right, can click on this “select wheel” to underline, add highlights, look up words in the dictionary, you select a line and it gives you the definition of every single word in that line. Shows the store. It is all black-and-white, can browse books, magazines, newspapers, blogs. there is a Kindle Daily Post, and “recommended for you.” Shows you National best seller lists from teh New York Times, Wall Street Journal, Washington Post [what about Amazon?]. Also can see Amazon reviews. and details you would see at the Amazon store. Clicks buy. [Interesting, my EVDO got disconnected as he was downloading—coincidence? ].